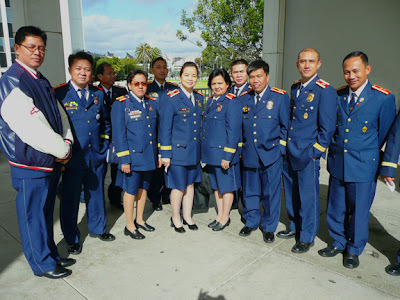 CRIME, GUNS, AND VIDEOTAPE: Meeting New Law Enforcement Friends In L.A.
Today I made some new friends that came in from the Philippines in order to attend a seminar on Internet cybercrime hosted by the FBI. These fine officers are on the cutting edge of the fight against worldwide Internet scams and child sexual exploitation. I was pleasantly surprised to see the policewomen wearing uniform skirts instead of patrolman pants. Oh, to return to the days when men were men and women were women. These fine officers are enjoying quite an adventure during their visit. I think Crimefile News has gained some new readers!